Although most of ICOs that were launched in 2017 never reached their goals, there are still some gems that continue developing their products despite the overall downtrend of the industry. Tezos is one of such projects. In this article, we’d like to review this platform, highlight the features that make it stand out among its competitors and try to understand whether this project has any chances of survival in the long-term perspective. Tezos is a platform for developing smart contracts and decentralized applications that aims to resolve the issues of existing blockchain solutions. Its developers work out their own way of decentralizing the network and have already achieved some substantial results. The project introduces its own terms as it names block validators ‘bakers’ instead of ‘miners’. The term ‘mining’ is associated with cryptocurrencies based on the proof-of-work algorithm. But Tezos offers an absolutely different approach and doesn’t want to be related to Bitcoin and other PoW-based cryptos anyhow. Founded by Arthur Breitman (ArthurB) and Kathleen Breitman (KathleenB). The project development started in 2014. ICO started on July 1, 2017, lasted for 2 weeks and raised 232 million USD. Mainnet was launched on September 17, 2018. Based on the programming language Michelson. Relies on the LPoS (Liquid-Proof-of-Stake) consensus. The network upgrades gradually through the self-amendment system which eliminates the need for the hard forks. Truly decentralized: 51% of baking power belongs to the community. All-time high TPS equals to 40. The team is working on a solution to increase network capacity. Has its own ways to stimulate users to be more active on the network. Now let’s review some of these features in details. On such blockchains as Ethereum and Bitcoin, the hard forks serve as a means of upgrading the network. The tool is not perfect as it splits the participants and leaves them guessing on which side to take. The self-amendment system of Tezos allows to gradually improve the network without the need for revolution. Tezos blockchain upgrades without having to split (“fork”) the network into two different blockchains. The proposed changes can be applied in a decentralized way by some parts of the network. Developers can offer changes to the network themselves. Those who get more votes of the community get compensation for their work and thus an incentive to improve the network further. This protocol is similar to Delegated-Proof-of-Stake (DPoS) utilized by such projects as EOS and Lisk. On DPoS, token holders are obliged to delegate their tokens to block producers while on LPoS this is optional. However, on EOS, the number of nodes to whom you can delegate your vote is limited by 21, which brings forward concerns about centralization. On LPoS, this number can be significantly increased. On Tezos, token holders can become network validators themselves if they purchase the entry share of 10,000 XTZ. One more important aspect of delegating your tokens on Tezos is the reputation of bakers. If a baker is caught at some unholy act (verifying double-spend transactions, for example), his reputation is worsened. Tezos holders can check bakers’ reputation and delegate their tokens only to those who have the highest rates. And here comes the next concern. Since users are lazy in their majority and don’t care to study the details of each proposal, they may prefer to delegate their tokens simply to bakers with the best reputation. This may lead to centralization since big bakers will aggregate more votes in time. This problem is resolved by freezing some of the bakers’ funds on the network. In order to bake new blocks, every baker has to deposit some funds that will be burnt in case they break the rules. The major part of the baking power belongs to the community, so Tezos can be truly named a decentralized cryptocurrency. One of the biggest problems that many blockchain-based projects have come across is the overall users’ laziness. Most of the cryptocurrency investors have joined the party only because of the hype around Bitcoin. They don’t care to study the projects they are investing in and don’t participate in the community life as they simply wait for the tokens to go ‘to the Moon’ and make them rich. Here’s what Tezos does in order to stimulate the users’ activity. The project adds 5.5% of coins to the network every year, causing inflation and reducing the cost of each token. However, if users conduct some activities on the network, delegate their tokens and participate in the community’s life, they get rewarded and thus eliminate their losses. So, it’s more profitable to be an active user than to sit still and hold tokens on your wallet. 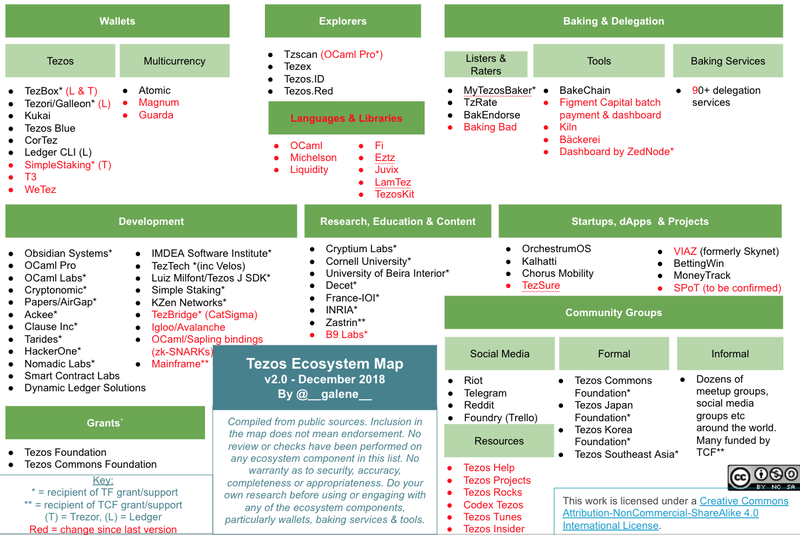 The Tezos ecosystem is already huge and includes many projects that cover such areas as Tezos wallets, different applications that facilitate developers’ lives, educational centers, and many more. As of December 2018, the ecosystem included the elements that you can see in this image. Obsidian Systems – the B2B software development company that provides deployment, maintenance, and implementation services. OCaml Pro, OCaml Labs – the team that stands behind the creation of this programming language. Cryptonomic – the NYC-based startup that provides tools and smart contracts for developers. Tezsure – a decentralized insurance system on Tezos. Tezos is a truly promising project with a strong team and a huge community behind it. It has already achieved many of its goals. It has a higher throughput index than Ethereum and provides decentralization that leads to higher security of the network. There are still many features to implement and many issues to resolve, but the founders don’t standby idly. The project evolves, new updates are released on a weekly basis and new development teams join it all around the world.